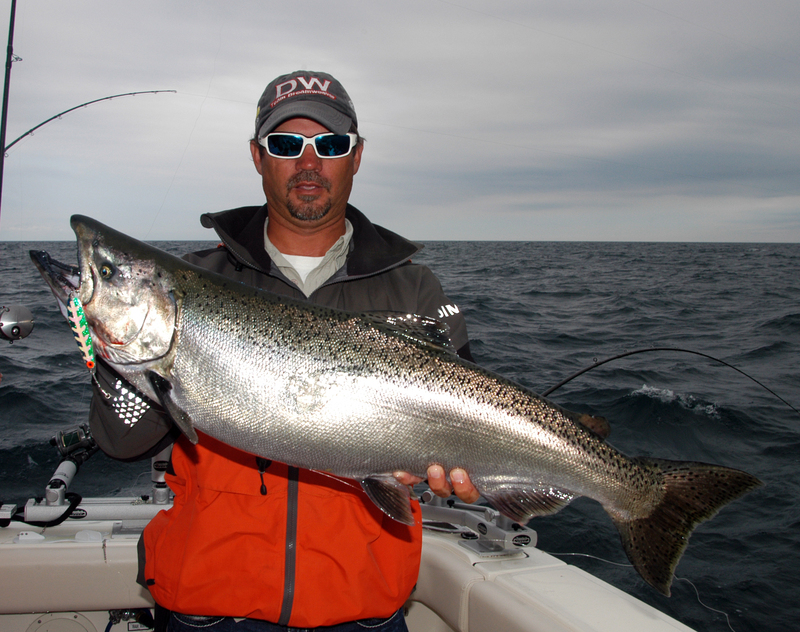 GRAND HAVEN, MI – Salmon anglers can look forward keeping five per day again in 2014. That’s what Michigan DNR fisheries managers have concluded after reviewing 2013 catch rates and angler success for charter captains on Lake Michigan. “Based on the decision rules we have, we are not going to change the bag limit. It will be five again,” said Todd Kalish, the Lake Michigan Basin coordinator for the Michigan DNR. Kalish was addressing members of the Lake Michigan Citizens Fisheries Advisory Committee at their recent meeting in Grand Haven. The annual bag limit for salmon is determined on a year to year basis, Kalish said. The decision depends on catch rates (the number of salmon caught per hour), and angler success, (the percentage of charter anglers that catch three or more salmon per day). Both measures have to drop below an established threshold to lower the daily limit to three. A staff review of both in 2013 showed only angler success fell below the benchmark of 13.1 percent. It was 2.9 percent. Lake Michigan charter captains caught .226 fish per hour which was above the cutoff of .165 fish per hour. That caught some by surprise. Lake Michigan charter captains complained throughout the 2013 fishing season that they were seeing fewer salmon per trip, though most were larger than in recent years. Some argued at the meeting that the limit should be lowered to three to conserve fish and to make it easier for customers to go home with daily limit. They maintain that limit catches sell trips. A lower limit also allows charter operators to head back to port earlier and avoid the slow-fishing mid-morning hours that can sour a client. Some also argued that too many fish get wasted with a five-fish limit – that customers end up throwing some away. But others captains say a five fish limit does more to conserve the dwindling alewife population by reducing the feeding pressure on it, one of the concerns that led to the development of the daily limit decision tool six years ago. A five fish limit also allows the occasional angler to come out and take them. Terry Walsh, the president of the Michigan Charter Boat Association called for a biological basis for making the decision. He said things are “out of whack” and are driven by “greed,” that people are talking in terms of having to get a limit rather than what the lake will sustain. “We got six fish and they were happy and booked two trips for next year,” Grinold said. Kalish said a Michigan Sea Grant study of charter customers found that more important than the number of the fish is the quality of the experience they have. “The number one thing (found in the study) was the demeanor of the captain. It’s about the experience,” Kalish said. Having a limit of three or five fish per day has little direct biological impact on the fishery, according to Kalish, at least not in most situations. But it can have a direct impact if alewife populations or salmon numbers are extremely low. Kalish suspects the reason that the catch per hour figure didn’t drop was because charter captains fished fewer hours on trips and headed back to port early. They spent fewer hours catching little. Members of the LMCAC and DNR agreed to revisit the decision-making formula in spring and discuss the science behind it and whether another method is needed to determine daily bag limits. This entry was posted in Uncategorized and tagged Conservation, DNR, Fishing, Lake Michigan, Michigan Department of Natural Resources, Salmon. Bookmark the permalink.